Designing SUSTAINED change always means intervening in systems. But what is a ‘system’? To clarify what ‘system’ means, I’ve discovered/thought of 28 statements about systems. Most of these are well known and can be discovered by Googling ‘system thinking’. Some are based on Donella Meadows‘ work and System Dynamics. Some are from books on resilience thinking. Some are my own. 1) A system is a set of components, or actors, that works as a whole to transform resources (inputs) into products and wastes (outputs). 2) Systems include cells, plants, ecosystems, catchments, people, communities, associations, corporations, institutions, states and economies, as well as non-living systems like factories and distribution networks. 3) Systems are often life support systems for their actors. What makes a system a system is the flow of information, energy, materials and services between the actors. 4) Systems are hierarchically nested within other systems. The actors of systems are themselves kinds of systems. 5) Although a system’s function is determined by its products, the goal or purpose of a human system depends on the worldviews of the actors and observers. One system can have many purposes, depending on the perspectives of the observers. 6) Efficiency, effectiveness, sustainability, resilience, productivity, addiction, health, sickness, and failure are all qualities or manifestations of systems. 7) Systems can be persistent or temporary (transient). Persistent systems (like associations, corporations and states) have specialised actors carrying out coordination functions. Transient systems do not. 10) Natural systems like cells and catchments are tangible. Human systems like communities, corporations and economies are intangible: their actors (individual humans) are bound together simply by agreed laws and social norms. Because human systems depend on the intangible mental states of their actors, their beliefs, values, goals and worldviews can be tremendously important and contested. 11) There are no such things as ‘externalities’. The boundaries of a system are entirely a matter of the convenience and biases of the observers. Who is in and who is out of a system is a subjective decision of the observer, which is why ‘window’ is a better term than ‘boundary’. 12) Closed system windows produce closed thinking (or silo thinking) with impoverished behavioural and cognitive repertoires which lower system adaptiveness. In-system actors are biased towards perceiving closed windows because that makes their decision-making easier. 13) Permeable systems welcome out-system actors. Such systems are always more adaptable. 14) Systems are adaptive. Variation and novelty are constantly being added. Selective pressures are constantly driving evolution of individual actors and the whole system. 15) Systems do not change in linear, predictable, incremental fashions. 17) How effectively systems adapt to changing environments and shocks depends on the timeliness of feedback loops, the existence of buffers, and the diversity of capabilities, ideas and ways of being of the actors. The more diverse the actors and abundant the buffers, the richer the adaptive possibilities. 18) Buffers of un-utilised resources, time, energy, are essential for adaptation and innovation. Buffers are also vital for system resilience. The larger the buffers, the more shocks a system can absorb before being pushed over a threshold into a different regime. 19) Diversity is essential for resilience. “Functional diversity” means having a diversity of actors, each with a different response to changed conditions. This creates a wide repertoire of possible adaptive responses. 21) Systems always grow in size, resource consumption, and output, subject only to resource limits and competition from other systems. It is debatable whether expansion is innate to systems. However in turbulent, competitive environments with high unpredictability expansion is practically mandated by the actors’ innate needs for safety and predictability. 22) Because a system’s actors are themselves systems that seek to expand, accumulating resources, information and energy, natural systems have complex feedback and control mechanisms to maintain internal balance (homeostasis) and limit the gain to dominant actors. Failure of these mechanisms leads to uncontrolled growth of some actors, starvation of others, and friction (conflict), reducing the overall productivity of the system. 23) Feedback loops are how systems manage their internal processes. Absent or poorly designed feedback loops lead to boom/bust oscillations. 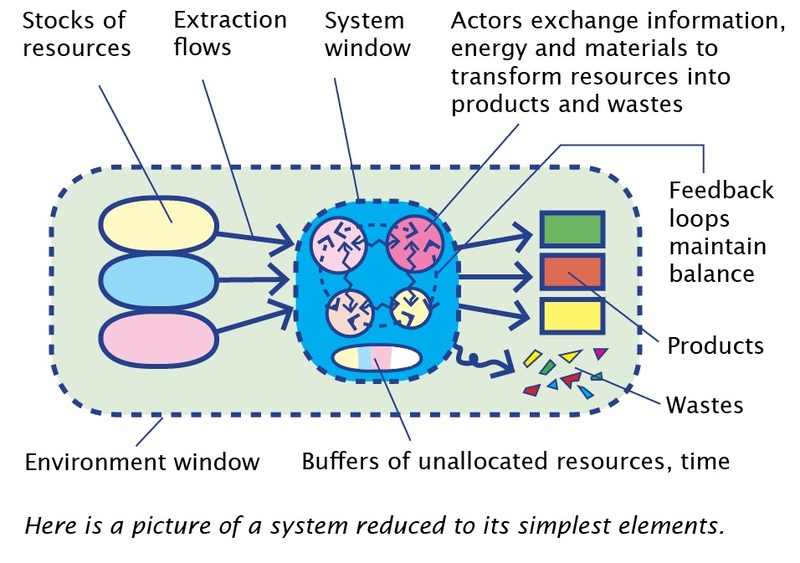 24) A system is an entropy engine: it takes resources and splits them into a stream of more refined products (with lower entropy or disorder) and a stream of wastes (with higher entropy or disorder). 25) The products and wastes of natural systems are usually inputs into other systems. That’s what the ‘web of life’ means. 26) Systems always produce wastes. The ability of environments to absorb wastes depends on ‘sinks’ in the environment. Usually these sinks are themselves natural systems (for example carbon sinks are photosynthesis by plants and chemical and biological processes in the oceans). 27) System stability depends on resource stability. Cut or dramatically increase resources and the result is increasing internal conflict until the system passes a resilience threshold into a different stable state. This explains why the inflow of New World silver pushed sixteenth century Europe into chaos, and the chronic instability of every resource-rich developing nation. 28) The dysfunctions of systems are internal (siloing, failure of feedback loops, actors hoarding information and energy), or external (exhaustion of resources, competition, pollution of the environment by wastes). There. That’s a pretty thorough definition of “system”. Dear readers: Can you think of any more statements? Have I got anything wrong?